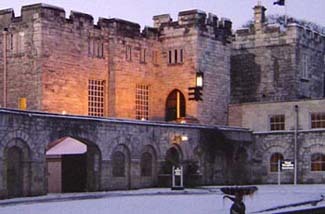 Written records for Hazlewood Castle begin with the 11th-century Domesday Book, that vehicle of taxation and land control for William the Conqueror. Hazlewood’s tenant was Sir Mauger the Vavasour, who, as the name implies, was the 2nd-tier vassal to the king. The Vavasours held the property for over 900 years until they sold it in 1908. A succession of owners and stints as a maternity hospital and a Carmelite retreat mark Hazlewood’s 20th-century history until its opening as a hotel in 1997. An interesting architectural side note took place during the reign of Henry VIII. The Vavasours were Catholic, and to hide their religion, they added priest holes to the tower and an underground passage leading away from the property. Priests, if caught, were certain to be hanged, drawn, and quartered. If price isn’t a concern, take a room inside the castle. Owners Brian and Andrea Walker have plans to add 36 new guest rooms in the future. Set in 77 acres of parkland, woods, and gardens, Hazlewood Castle continues a tradition of providing beautiful surroundings for a getaway retreat. After several hundred years, the castle has retained its architectural integrity. Interiors are warm and inviting, and a personable staff ensures an excellent stay. Each individually decorated guest room bears the name of a flower; many have four-poster beds and sofas and vary in size. Nine rooms are found inside the castle. The Rose Suite has a view of the gardens, while the Honeysuckle Suite sits alone in the west wing, with a small stairway leading to the bathroom. The rest of the guest rooms are located across the courtyard in a separate building. Named the “1086” after the date of the Domesday Book, the hotel’s restaurant enjoys an excellent reputation. If you have good weather during your visit, you can enjoy the gardens from a very pretty patio area.